I wanted to just say in an Instagram post about how wonderful our Saturday mornings have been and how we have embraced our “time off.” But that post was getting long and I was like. Wait you have a blog. Say it there. The kids go on visits a few Saturday mornings a month. In all honesty at first it was hard. Hard to see them react with less than excitement about going on a visit; the unknown of what happens when these kids who’ve been entrusted to us are not in our care. The return, which is typically a hot mess of day. So much emotion all over the map. It’s extra draining. But then I said YO-GAFHOENAT (which is just like YOLO). Short for you only get a few hours off every now and then. And for the last 3 visits which are about 3 hours door to door we are wild women! The only drawback is we have no real clue when these visits are gonna happen. You’d think maybe there would be some courtesy of a calendar/ plan. Not exactly. So we generally have about 12 hours to make plans. This week I had it on pretty good word the kids were going on a visit and if it was going to be like the past it would be in the morning. 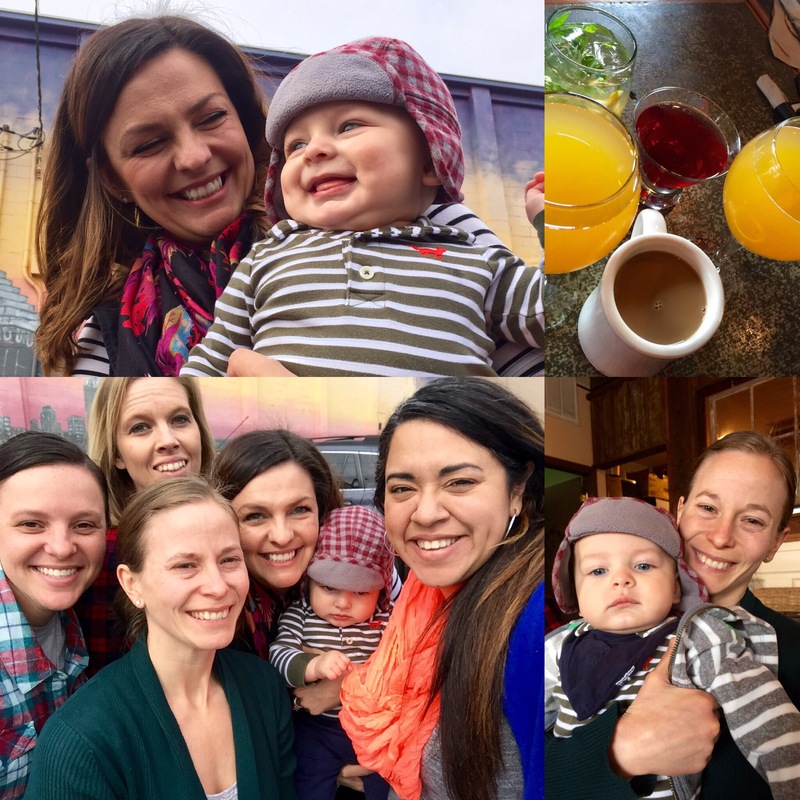 Earlier this month Kelly (one our our teammates….mother of precious baby Easton….pictured above) called to say Amy and Ashleigh would be in town. So we planned for brunch and they accommodated our schedule and boom high quality (less quantity than I would like) friend time. I don’t say enough about these women who we played softball with but damn, we are lucky. Didn’t realize how those morning workouts would bond you for life. Every single one of them. I think of them and pray for them often (and talk to as often as I can). Anyway, it’s just so cool for me and Meg to experience life with people who love us and support us. : sometimes I get sad and thing “we have no friends” (unhealthy cognition to unpack another time) and I am reminded that my life is FULL and the investments we’ve made in relationships are very present even if they aren’t always “present”. You get it? Kelly is parenting like a boss, raising a gorgeous tiny human and working it as a badass business woman. Ashleigh continues to be part of research that improves people’s medical lives all while caring for so many people (she brought more kids clothes for us) AND amy. Oh my AmyA08 beautiful soul who has so much to give, thanks for my mini assessment of my wrist. I miss them so much. And I love them all and can’t wait to see them again; even is 40% of our conversations include them extending sympathy to Meg for putting up with me. Cheers to our adulting and continued connection.